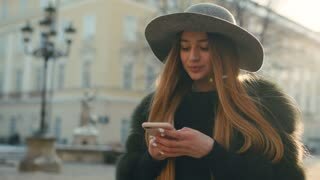 Brunette woman standing in the subway platform and using smartphone. Girl surfing the Internet while waiting the train. Attractive young woman at a mountain ski resort. Standing on a snow using on her mobile phone. Young brunette woman going somewhere in moving subway train. 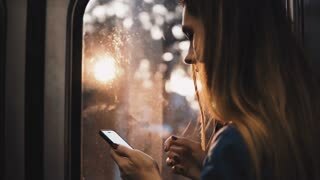 Girl using smartphone standing near the window on sunset.